Add instant glamour to every masked ball with this beautiful Elegance Barocca Filigree Masquerade Mask by Simply Masquerade. A must-have for all shining stars, this gorgeous accessory mask is designed in antique silver coloured filigree metal and features a smooth polished silver handle, while the authentic Swarovski crystals are glistening intently for embellishment. 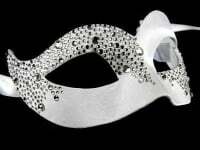 Sparkle for every party occasion and stand out for your star quality with this fabulous filigree mask that will give every look a hint of luxury. Designed for a woman and as such, its elegant and striking design commands an air of class that is sure to impress. All our masks are handcrafted in Venice - Are others?